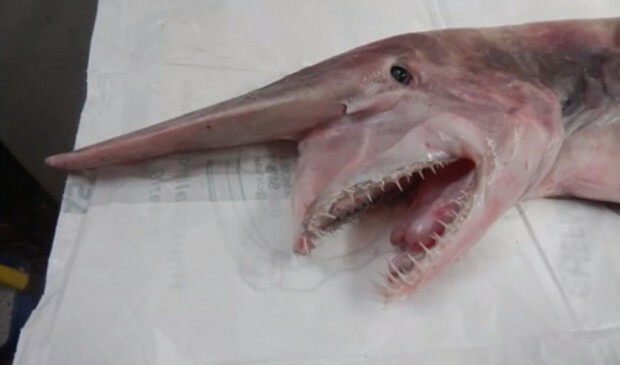 A fisherman accidentally caught a rare “goblin shark” last month off the coast of Key West, Florida. Scientists say the April 19 catch is only the second time on record that a shark like it has been captured in the Gulf of Mexico, according to the National Oceanic and Atmospheric Administration. “Although it is thought to be a great exhibit, it has rarely been kept in captivity. One specimen survived in an aquarium for a week at Tokai University, Shimizu, Japan,” the NOAA further explains on their website. The estimated 18-foot shark was caught by fisherman Carl Moore. He didn’t even realize what he had caught when he saw the fish and actually threw it back in the ocean after snapping some pictures.